But they tend to focus on what the options are for buying a new housing, which pretty much all cost over £1000, not that it’s easy to find out about prices because the majority of decent manufacturers are custom made so they don’t have a set price list. The big exception is Aquatech which can be purchased off the shelf (check out camerasunderwater.co.uk for a full range of Aquatech housings if you’re in the UK), since I’ve been interested in shooting pictures and video in the sea I’ve always thought it was a bit weird that you couldn’t just buy a “splash housing” (tech speak for a housing which is designed to be used on the surface, not dived with) like you could a dive housing. The market is just too small to make it worthwhile mass producing them so all these independent small businesses offer their own versions of very similar things for similar prices and need to keep the prices high enough to stay in business. I’ve made my own housings in the past but since having an actual surf housing I wouldn’t look back, if you know you’re going to enjoy it it’s worth getting one if you can afford it. I spent significantly less than half that on my set-up, the 60D body I bought was refurbished (it looks like new and has a years warranty from Canon), all the rest was second hand. There’s a couple of issues which can be easily fixed with a soldering iron and some cheap components, making it a perfect project for someone wanting to start out which might not go for too much more that the starting bid of £500. There will be a massive load of cheap plastic bag style cases and the filters will only help so much so be prepared to sift through a few pages of crap to find the odd bit of gold. Don’t expect it to be accurately named or listed either, this is often how you can get a good deal though so patience is key, If you’ve got a smart phone or tablet the Ebay App is great and makes it easier to scan some pages when you get a minute. Also check out the Sporting Goods > SCUBA & Snorkelling > Cameras & Camera Accessories category which occasionally throws up some interesting bits which presumably get listed there by divers who don’t notice the other more popular category. 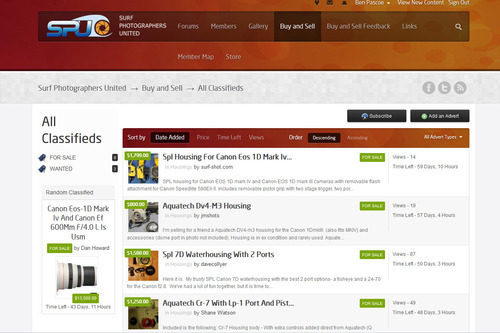 Surf Photographers United seemed pretty active a few years ago but I wasn’t sucked in as you had to pay a subscription fee to see the majority of the forums, now it’s been re-launched without the fee and it seems to have a pretty active Classifieds section that’s definitely worth checking out. I’ve spoken to a couple of people who have had luck with the Aquatech Facebook page, if you click on the See all link in the Recent posts by others block on the right hand side of the page you will usually see a few people offering their second hand housings for sale, it’s obviously a global site so they’re all over the world but you might find a bargain if you’re lucky, and you can always post a wanted ad’ on the wall. Disclaimer: I have no association with Camerasunderwater but I have bought a few housings from them and have always been impressed with the service, I will definitely be buying from them in the future. I don’t know the person who’s selling the housing on Ebay.